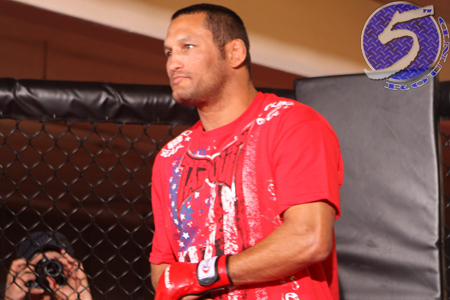 After Dan Henderson (Pictured) pulled out a grueling decision win over Mauricio “Shogun” Rua in what many believe to be the scrap of the year, Henderson requested for his next bout to be of the light heavyweight championship variety. Unfortunately for Hendo, the UFC subsequently announced a 205-pound top contender bout between Rashad Evans and Phil Davis would headline their follow-up show on FOX, which would grant the victor next dibs at Jon Jones’ crown – assuming Jones upholds his 5-to-1 favorite status against Lyoto Machida on Saturday, of course – and leave Henderson on the outside looking in. However, there still appears to be hope for the 41-year-old Henderson. During Thursday’s press conference in Toronto, Canada, UFC president Dana White was asked to specify the exact pecking order on the light heavyweight totem pole. White’s response was encouraging for Evans, disappointing for Davis and hopeful for Henderson. “[Jones] wants to take some time off after this fight,” White said of his overworked champion. “He’s fought four times this year, which is a lot in this sport. Three is normal, four is unbelievable, and especially with the level of talent that he’s been facing this year. By connecting the dots, ‘we’ll see’ seemingly translates to the company believing Davis’ resume doesn’t warrant a title fight at this time, even if he were able to extend his record to a perfect 10-0 by beating Evans. If that is indeed the case, expect for Henderson to be glued to his television set on January 28th with his Phil Davis fanboy hat in tow.